I previously wrote about the KonMari method, and I finally got around to start the process. The first category is clothes, so lets get started. I have been struggling for a while with the amount of clothes I have, the fact that I had so many meant I used longer on finding anything and normally I would only use about 20% of the clothes anyway. There are many reasons for this, one of which is that I moved back to Norway recently from staying in England for 2 years; some of the clothes was packed away before I went to England in the first place, and some came with me from England where my day-to-day life and as such clothing needs were different. 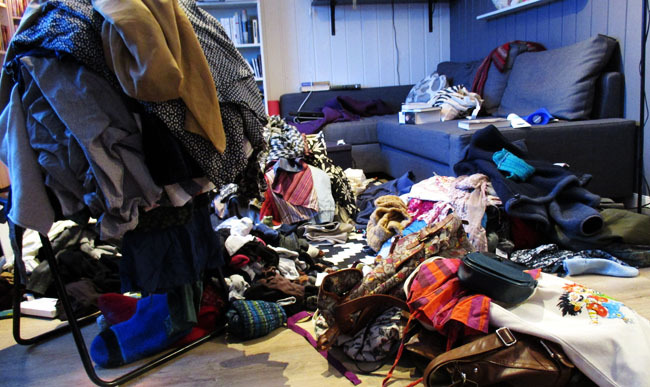 Finding out about the KonMari method was like magic: finally a way to truly have a clear wardrobe that reflects me! Finally a way to truly have a wardrobe that reflects you! Marie Kondo states that the average number of items before starting the process is 160, my first reaction was that I have way more than that! And that turned out to be true. Now a few things for accuracy: my count excludes socks, underwear, accessories (scarfs, hats, mittens etc), coats and equipment (clothes for skiing and my bathing suit). It’s included in the process, but not my count. 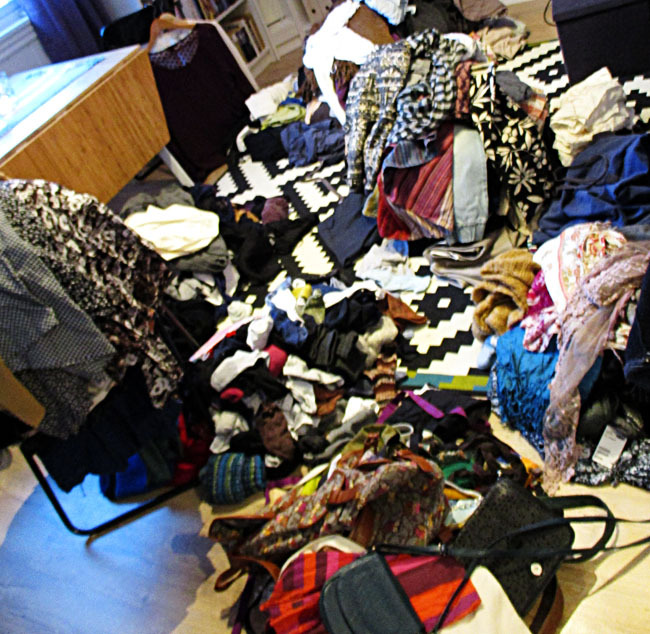 So the total amount of clothes before the KonMari process: 206 – After the KonMari process: 109. That’s right, I almost halved the amount of clothes I own! The method is simple; you put all your clothes on the floor, from everywhere. The you sort them in several subcategories (tops, bottoms, underwear, etc). This step filled my whole living room floor. Then you pick up every item and ask yourself ‘Does it Spark Joy?’. If it sparks joy keep it, if not discard it. Easy right? And it actually was! 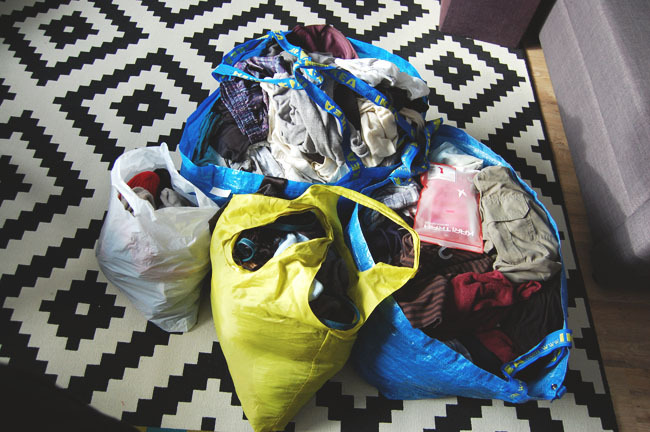 Once I managed to think of it like that I felt lighter, for every piece of clothing I put in the discard pile I felt lighter and more able to see the life I want to lead. Now my whole wardrobe sparks joy. I feel happy when I look at it, in the evening when I pick out the outfit for the next day I feel the joy. And that’s the most liberating thing about the whole process, I no longer feel guilty for the clothes I don’t use, I only see the possibilities. My shelves are not that practical, but I’ve sorted the clothes in categories and used the whole depth of them, just so I can see all my clothes at once. So I couldn’t use the KonMari folding method for most of my clothes, but I hope to get more of the boxes so I can do it with everything! My hanging space: not sorted by color, but by use which I hope will work better for me. 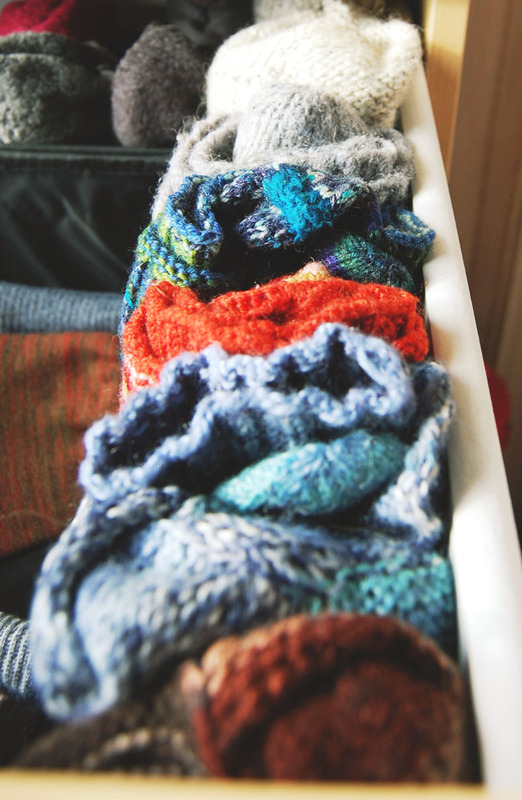 My thick wool sock collection, it has always sparked joy for me, and to be honest I didn’t get rid of any of them. I throw them out if they get worn, and knit new ones if I need too! I got these practical boxes at Ikea, and they fit perfectly for the KonMari folding method! My wardrobe is not that good for organizing; as you can see above the shelves are deep and tall, which means the system quickly breaks down. But the boxes are lifesavers, they mean I can stack the clothes standing up like Marie Kondo recommends. Another thing that brings me great joy is the pile of clothes I can donate! I’m happy both for getting all of it out of my house, and that someone else might get joy from it in the future. You can join the KonMari group board on Pinterest for inspiration as I move on to my collection of books! 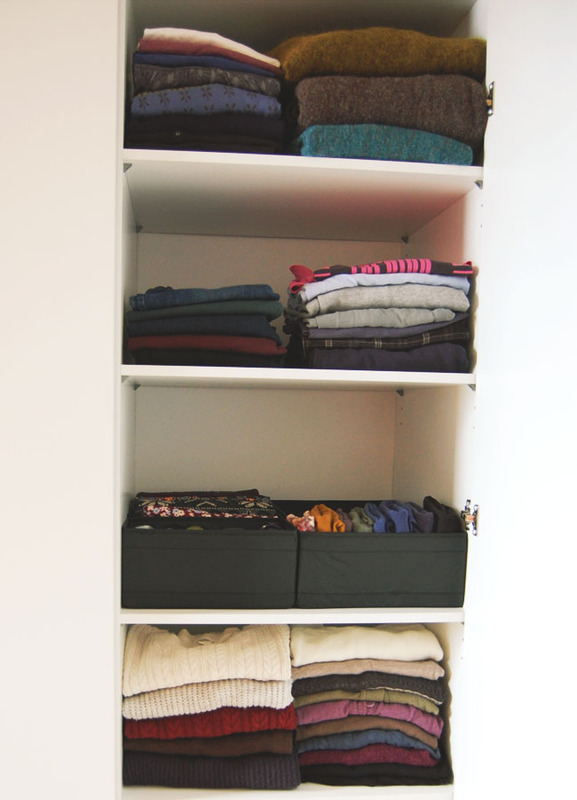 Følg Tale | FindingNorths tavle KonMari | How to spark joy | Marie Kondo Group Board på Pinterest. I have also made some KonMari printables that you can access by signing up below! What if nothing you have really sparks joy? Hi Tale! Great post! Your after pictures are beautiful. 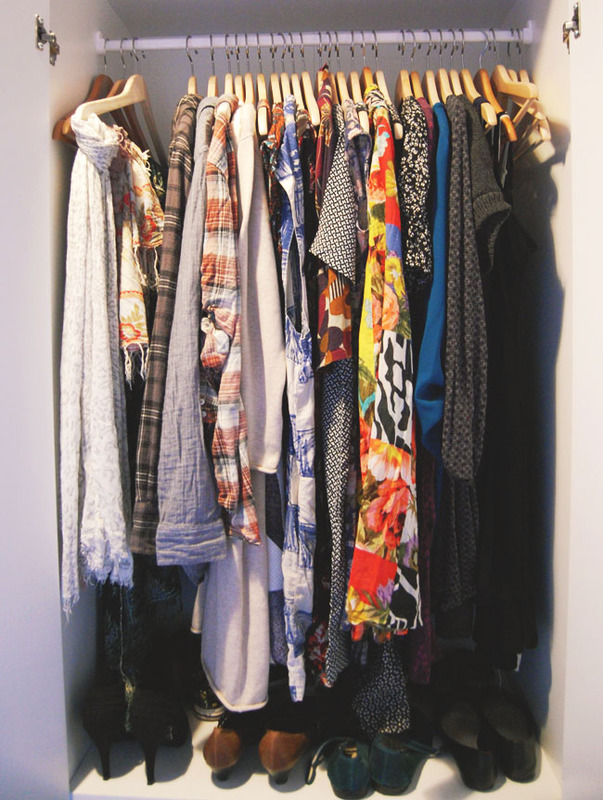 My closet needs this!